This soup is a great way to use up the ham bone from a holiday meal. Any combination of white beans will work as long as they have around the same cooking time. Extra chopped ham can be added if there is a lot left over as well, but is not required. Wash beans and soak in cold water overnight. Bring two tablespoons butter and one tablespoon olive oil to heat in a large pot. Add white part of leeks and cook until softened. Add celery and garlic and cook until fragrant. Add ham bone and cook over medium heat until any meat is slightly seared. Add wine and deglaze pan. Add beans, chicken stock, two cups water, green part of leeks, and cinnamon stick. Bring to a boil then simmer until beans are soft, about an hour. Add more water to soup if level gets to low. Add chopped ham and cook until hot and soup is thick. Remove the bone and the cinnamon stick. Serve with biscuits or corn bread. This entry was posted in Dinner, Food, Recipes, Soups and tagged bean, ham, leftover, soup. Bookmark the permalink. I have been telling all my friends back in Sydney who are complaining that they are still eating ham four days after Christmas to make something like this !! One of my favourite things to flavour a soup. So hearty. And you can freeze it and not even eat it that night too. That recipe is in the line up too. I’ve never thought of lima beans or garbanzo beans as “white” beans before. I like both of those beans and I don’t like any of the truly white beans at all. I usually avoid any recipe calling for white beans, but you have given me something to think about — thanks! This soup looks great, Greg! I’ve been known to bake a ham just to get a bone to make a big pot of soup. Having a couple quarts frozen in the back of the freezer sure come in hand when January’s low temps hit. That sounds like a hearty post Christmas dose of comfort food. Nice one. Just what I need as a post Christmas recovery meal. Delicious! You really got my attention with the cinnamon stick, had a hard time imagining that flavor in there. Ham bone makes a great soup every time and beans are a wonderful way to start the new year with a healthy meal. Just think of all the sweet ingredients you put in a ham glaze. It’s not nearly like that, but might be easier to picture the pairing that way. The flavor was pretty subtle. I love to make white bean soup with a ham bone. I think your cinnamon stick is an interesting ingredient. Will try that next time. Don’t do it biscuit! Dip a toe in at a time! DANG. This only makes me sadder that I don’t get to enjoy the leftover ham that my mom makes for Christmas. That’s what happens when you live 1800 miles away from your folks. But this looks great! Greg, I have a ham bone waiting in the fridge, I’ve printed the recipe and am ready to cook! This looks delicious! One for you, two for me. I agree with Judy and Lea Ann…I would never have thought to put a cinnamon stick in the beans. But I can see your point that it would compliment the glaze that was on your ham. Yum! We made beans with our ham bone! Cheddar Biscuit . . . YUM! This is a good idea. We love beans in a soup and using the ham up is a plan, Stan. Looks so comforting…and the cinnamon stick is really an interesting twist. You know I’m just going to have to try that out myself!!! I’d love to see the recipe for the biscuit. Looks good with healthy ingredients. Soup will be great when the weather is clod outside. Nothing like a good bean soup in winter, and this looks bone-warmingly good! no lie i am glad i saw this post today and not tomorrow because i was going to make ham soup tonight with our leftovers. Trying your recipe tonight! Another great ham leftover recipe. Now nothing gets wasted even the bones are utilized. 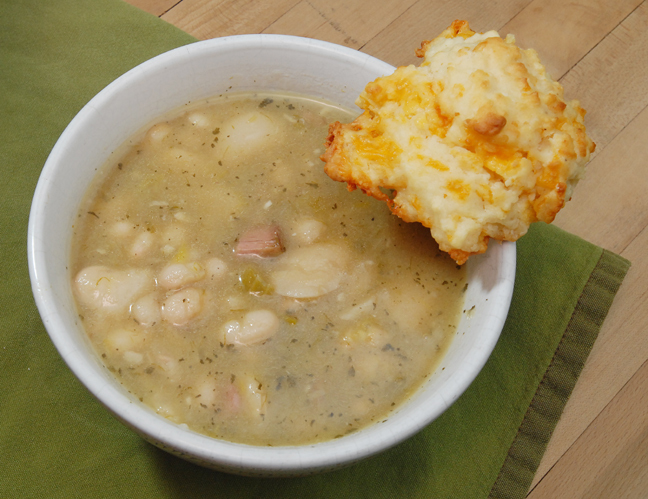 Ham soup is always comforting and delicious, but that biscuit – wow, does it look like it needs a swim. Yum! I love a good ham and bean soup! I wish i had a bowl right now…my apartment is freezing and I’m too lazy to get up and turn the heat up, hehe. Oh that looks good. I wonder of my mom will give up her ham bone? Ha, not likely. this sounds delicious and a nice change from what we call French Pea Soup. Every soup cooked on smoked bones has a heavenly taste! This one looks so good, I want to buy a whole smoked ham just to make it! My mum used to make a delicious dried pea soup on smoked bones, but I cannot find them anywhere. Buying ham with bone might be a solution. Ham bone does make a soup extra delicious. I love split pea with a ham hock cooked in. Your soup looks so perfect for one of these “cold’ winter days we have been experiencing here (about 75 degrees yesterday!). I’m pretty sure I could live just on the biscuits alone. The whole dish looks very tasty! I like a good bean soup to usher in the new year and this looks perfect. A ham and bean soup is a common result of one of my weekend cooking binges. Especially with the bone from a picnic shoulder/ham. I still have some of the cannelinni beans that my father grew to use in it though I’ll have to go back to navy or great northern beans when they finally run out. And for a stock. I use the broth strained from cooking the ham as a base along with a mirepoix of onions, carrots and celery, of course. 🙂 And that biscuit looks pretty cheesy to me. I love bean-and-ham soups. This looks like a good one. Thanks for sharing. We did the same thing the date you posted this, had not had beans in a long time and they tasted so good! Love your picture! Cooking this today! We love it. Very nice! I made Split pea soup today and used up my ham bone!